You know the old story about urban redevelopment: “They paved paradise and put up a parking lot,” as the singer-songwriter Joni Mitchell put it. A new exhibition, Sign of the Times, going up at History San José, pays tribute to a chapter of Silicon Valley’s history fast fading from view. 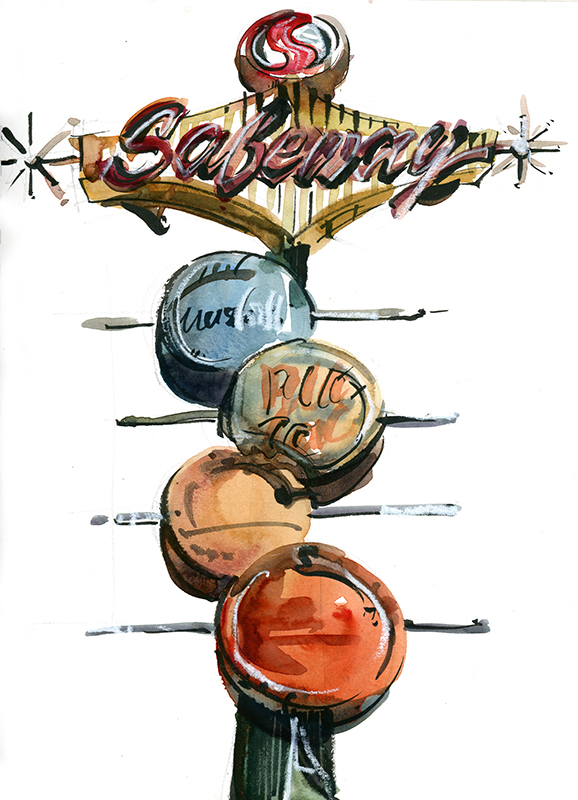 Vintage signs - for shops, restaurants, bowling alleys, and so on - have a way of encapsulating our sense of place. Sometimes, the signs become landmarks, vestigial reminders of places that no longer exist. Originally from Bombay, Suhita Shirodkar is an illustrator and graphic designer who moved to San Jose about 20 years ago. "I originally thought I was coming here for a couple of years, and then I ended up meeting my husband and staying on," she says. The graphic design tethers her to a computer, but sketching is something she can do anytime, anywhere. "I’m an urban sketcher, which means I walk around with a sketchbook all day in my bag, and I draw anything that catches my eye," she says. 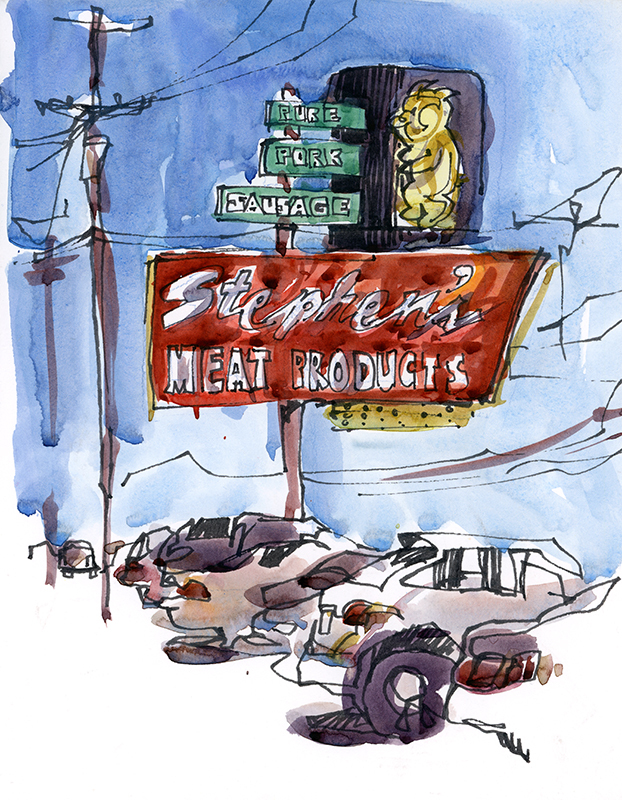 Shirodkar noticed over time she was filling her sketchbooks with drawings and watercolors of signs like the “Dancing Pig” that advertises the now demolished Stephen’s Meat Products on Montgomery Street. The signs point to a world that disappeared before she got here. After sketching a sign, Shirodkar heads online to resources like History San José's Research Library and Archives, as well as The San Jose Signs Project. "I really like these signs. They sort of pulled me back into history, which is really what art does. It becomes a reason to understanding something, why something’s important -- or why it needs to stay," Shirodkar says. Does that make her sound like an activist? She is one. 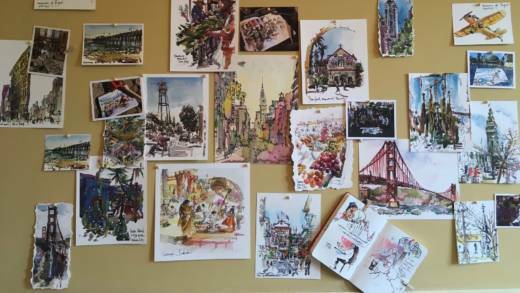 Peruse the more than 50 sketches on display at History San José, and you may find yourself signing up to help preserve them. Signs of the Times is open to the public on weekends at History San José until December 23, 2018. For more information, click here.